The recent anecdotal evidence of an increase in phone searches at the border turns out to be spot on. According to data obtained by NBC News, the number of phone searches at the border has skyrocketed this year, with more searches performed on phones in February 2017 than the entire year of 2015. The data reported by NBC shows a staggering increase over the past few years. In 2015, for example, the Department of Homeland Security (DHS) searched less than 5,000 phones; in 2016, DHS searched more than 25,000 phones. If February is any indication, 2017 looks to be even more dramatic. But the officials caution that rhetoric about a Muslim registry and ban during the presidential campaign also seems to have emboldened federal agents to act more forcefully. NBC interviewed 25 American citizens who were the targets of phone confiscations; twenty-three were Muslim. The report highlighted some of these cases, including one in which a Customs and Border Protection officer put an American citizen in a chokehold for refusing to hand over his phone. The chaos that followed the infamous executive order also highlighted a sad reality of the US border: Your experience can be smooth sailing or a horrible nightmare, and there’s not much you can do about it. That didn’t start when Trump got his sticky hands on immigration policy. Protections against unreasonable search and seizure simply don’t apply at the border. As an ACLU staff attorney told NBC, “the shackles are off” at the border. 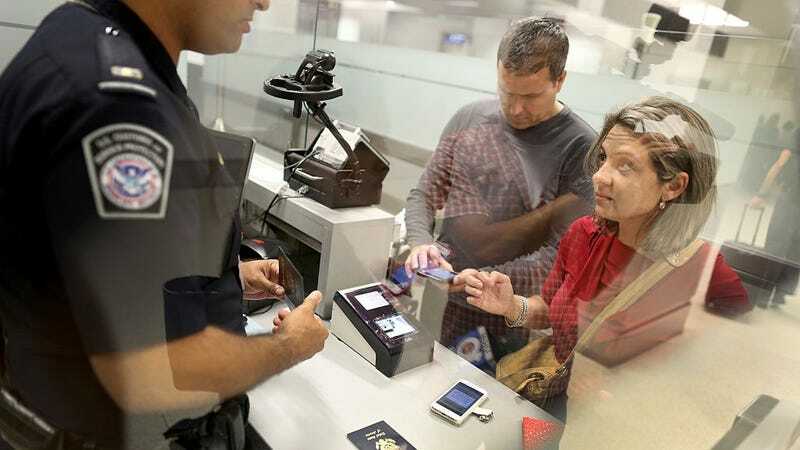 If you are traveling across the border, however, there are several guides to making your phone more secure before leaving; the Electronic Frontier Foundation has even produced a handy printable one. This latest report is evidence you’re better off sticking to it next time you travel, whether you’re an American citizen or not.